All pups that leave us are up to date with vaccines (neotech), wormed, have been treated for coccidia prevention,vet checked and microchipped. We feed taste of the wild puppy. Pacific Stream - the salmon. Pups are priced at $2000/$2500.. shipping with a puppy nanny or by us is available. Shipping.. Puppies must be picked up here in person or can be hand delivered by us. 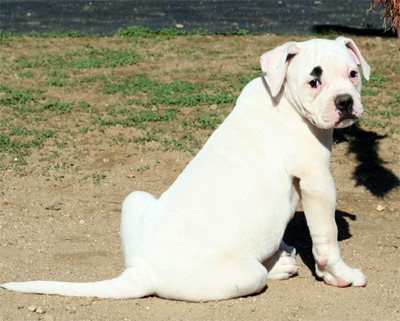 We sell our American Bulldog puppies with limited reg. we do not sell with breeding rights...if you are someone looking to make an "investment" and to start breeding we are not for you we like our dogs to go to permanent forever family homes. We do not have a lot of puppies..often there is along wait to get a puppy..quality not quantity is what we strive for. We have a litter to improve on what we have top picks are NEVER available. (IMPORTANT UPDATE) If pup is not paid for by then then your spot in making picks is moved behind those who have paid in full. We recently made the mistake of letting folks pick and holding there pup till the family came to pick it up and pay for it in full then..they had a problem paying, couldn't take the pup and so we had to repost him for sale...this upset all the others folks behind the original buyer who would have taken this pup had we known he was available but had taken another. We felt bad and so doing it this way will prevent this happening again to all concerned. On ALL males we retain 2 breeding's to our own females..it is unlikely that we will use them as we keep something from any litters we have but this is to ensure that we keep breeding only the best. If we do not keep first pick it will ONLY be offered on a co-own basis..we will NOT automatically move you up to 1st pick spot, if we co-own a pick dog we like it to be local and with someone we feel can offer it a great family home and it will be still available to us to show. The way we do picks is males and females are separate lists..a deposit is not for a spot on an overall list but for either the male OR female list...eg.We ALWAYS reserve first pick for our selves, if we decide not to keep a female here it does not mean you move up on the male list (or any list)..I hope this saves any confusion. A non refundable retainer/deposit of $500 is required to hold your puppy. We know sometimes people are unfortunately unable to take the puppy they had reserved..so we will however gladly move your deposit to one other similar litter of your choice should you cancel as a one time courtesy. NOTE..we will only honor a deposit for the period of 24 months after receiving it should you cancel for whatever reason.. the deposit is considered expired/lost/void after this as we will have assumed you are no longer interested in getting a puppy from us. If you were unable to take a pup and have a deposit with us PLEASE keep in touch with us so we know you are still wanting a pup and when will be a better time frame for you within the allowed 24 months. Some people have an easy time with Paypal others find it hard so alternately we can always send you our bank account info and you can just do a direct deposit..
We welcome visitors but please note our dogs live in and at our house we are not a "kennel facility"..we are just some regular folks who have a passion for our American Bulldogs..
All of our dogs are our own personal family pets ..NO adults are for sale at any time so please don't ask...it would be like selling a family member! Many of our dogs do not live here with us but with friends to ensure they get lots of attention and have a family of there own. © Copyright 2016/2017 Bybee's American Bulldogs (American Bulldog Association registered kennel name) All Rights Reserved.